Ladder and platform elements are a bit thick for the scale. 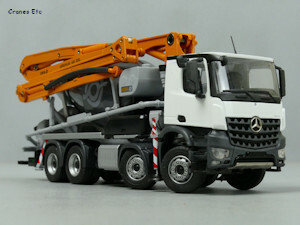 This model is a CIFA MK28L truck mixer concrete pump mounted on a Mercedes-Benz Arocs 8x4 chassis. 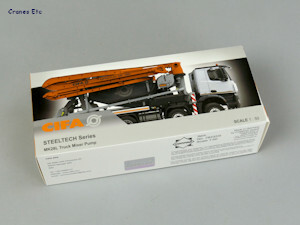 The model comes in a CIFA branded box with the model protected by a foam rubber insert. The review model had no defects and no missing parts. On the back of the box is some technical details about the real machine. The only assembly required is fitting door mirrors and a roof aerial. 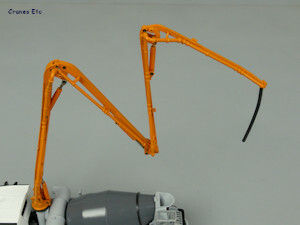 The chassis detailing at the rear has the axles and suspension modelled in plastic, and at the front the steering is modelled in a functional way. 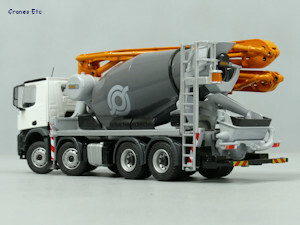 However, the drive shaft between the engine and the rear axles is missing which is a modelling compromise. The wheels look very smart and the tyres are the same on each axle. The cab has an aerial on the roof, and the lights at the front have plastic lenses. The Arocs grille looks good. Inside the cab details are simple. The mirror built in to the visor and the small door mirror are both unsilvered. The rear wheel arches are plastic, and at the rear the lights are painted. The rear stabilisers are modelled, but they are not functional. 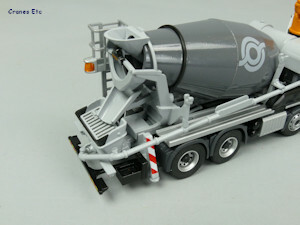 The mixer drum is metal with a plastic ring at the rear bearing, with simple graphics. The drive motor and water tank at the front are also metal as is the access platform at the rear although the handrails are thick. A large beacon light is included at the rear. The hopper and chute are plastic and there are fixed plastic chute extensions above the rear wheels. The hopper grille is plastic. The placing boom is a strong part made of metal as is the pipework. Simple CIFA graphics are on one of the boom sections. There is a plastic hose section at the end of the boom. 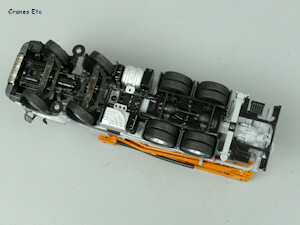 The front axles have steering and it is not linked, presumably because of other chassis details. 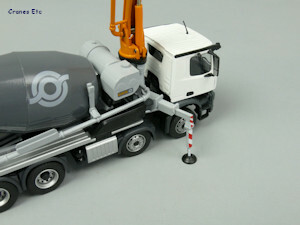 The model can be posed with a reasonable lock on the steering. 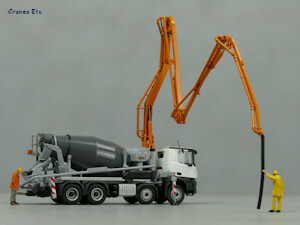 The rear driven axles have a degree of vertical movement to simulate suspension. 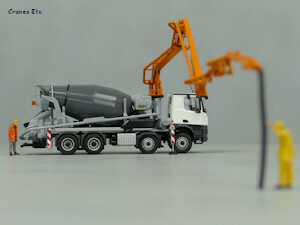 This model does not have a tilting cab. The drum rotates smoothly, and the rear chute can be angled across the hopper. The outrigger beams can be pulled out and the pads lowered by unscrewing the visible screw threads. 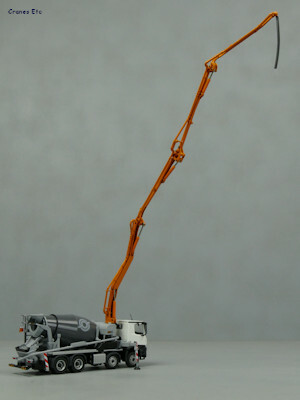 The placing boom is fully articulated with stiff rams so any pose can be set. It can be rotated fully. It has a high metal content and feels robust. The paint and graphics are to a good standard. The model is fair value. 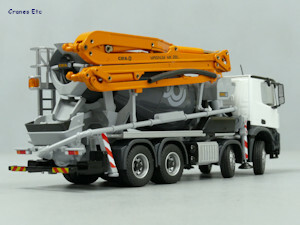 Conrad has produced a number of this type of model over the years and this one is to the usual standard. 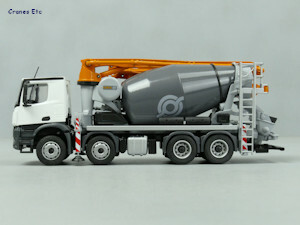 It is well made and robust with good functionality and reasonable detailing. The model was first delivered to CIFA at the end of 2017. Boom and pipes are metal.